Bristol City Council has sparked controversy by pressing ahead with further investment in its energy company. East Hampshire DC has increased its property portfolio to more than £110m after buying a Government building more than 300 miles away in Sunderland. Greenwich LBC is to rein in operations at its two companies as they struggle to compete in the outsourcing sector. Senior councillors in Portsmouth are due to vote on proposals to establish an authority-owned development company. Councillors have made a bid to rescue a council-owned energy company. Spelthorne BC has announced an end to its controversial policy of commercial property investments. 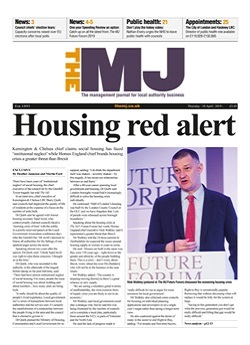 Six out of 10 senior council figures admit their authority is now only delivering a basic core offer of service, The MJ and LGiU think-tank’s annual local government finance survey has revealed. Auditor KPMG has warned of a ‘significant risk’ in the way Spelthorne BC controversially bought a BP business park for £385m. Marsham Street is ‘worried’ about ‘two or three’ councils’ commercial ventures, civil servants have said. Croydon LBC has completed the £53m purchase of another freehold site in the borough to provide additional income for frontline services. The purchase of a purpose-built student accommodation block in Cambridge will allow Cambridgeshire CC to plough £1.9m a year into frontline services. Shetland Islands Council has bought a property investment and development company for just under £17.5m. A senior civil servant has warned councils the Government could crack down if commercialisation trends continue. West Lindsey DC’s property investments have reached £14m with the purchase of a £6m site in Gainsborough – the authority’s biggest deal to date. Two more councils have announced income-generating investments as town halls seek the finances required to protect key services amid continued austerity.